Traralgon Fire Brigade is celebrating its 130th birthday with a new heavy pumper, providing a major boost to firefighting services in the Gippsland region. Member for Eastern Victoria Harriet Shing officially handed over the pumper today, as part of a $10.9 million state-wide roll out of 12 new heavy pumpers and three heavy tankers. 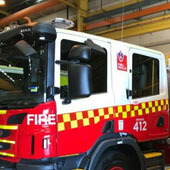 The heavy pumpers each cost about $800,000 and have been funded by the Andrews Labor Government. the latest battery technology, which reduces emissions and improves firefighter safety. The pumpers and their crew can provide support for structure fires and other major incidents across a 25-kilometre radius. Traralgon Fire Brigade was established in 1888 and has 80 members, comprising a mix of volunteer and career firefighters. The brigade responded to almost 700 incidents in the 2017-18 financial year. Traralgon is the fastest-growing town in the Latrobe Valley region, with a population of more than 25,000. "This new heavy pumper is an important addition to the Traralgon Fire Brigade fleet." "It provides firefighters with the latest technology to respond to fires and other major incidents, delivering a major boost to emergency services in the Gippsland region." "The Andrews Labor Government is working closely with the CFA to ensure volunteer and career firefighters have the equipment, infrastructure and training they need to respond to incidents and keep people safe."